At Mission Eye Care, we specialize in fitting complex corneas. We are the only clinic in Alberta with eye doctors residency trained in the fitting of specialty contact lenses. Because of our high number of referrals, we have access to lenses from almost every manufacturer in North America. Our highest rate of success for fitting keratoconus and other irregular cornea patients has come with scleral and hybrid lenses. These lenses give vision and comfort not possible with conventional rigid lens or piggyback designs. We take topographical maps of the exact irregularities and then custom design a lens that provides the ideal correction. Because of the way these lenses are fit, they can optically correct the distortion from diseased corneas, providing near perfect vision in the majority of cases! Scleral lenses are large diameter rigid lenses that sit on the white part of the eye and vault over the irregularities in the cornea. This enables them to provide good vision and excellent comfort. We are always on the leading edge of technological advancements and are proud to be the only clinic in Western Canada to fit the EyePrint Prosthetic contact lens. This lens is 3D printed from a custom mold taken of the front of the eye. We are one of the few non-university clinics in North America to offer this specialized lens, a superior alternative to the Boston PROSE lens. We are also one of the only clinics in Alberta that fit the entire family of SynergEyes hybrid lenses. Hybrids are suitable for keratoconus, post corneal transplant, and ectasia from failed refractive surgery. These lenses offer similar comfort to soft lenses and are very oxygen permeable. This makes them ideal for those who wear lenses for long hours. The center of these lenses is rigid, allowing for excellent optical correction, while the rest of the lens is soft, allowing for excellent comfort. We also fit specialty gas permeable lenses such as Rose-K, piggyback and other post-surgical designs for mild to moderate cases. 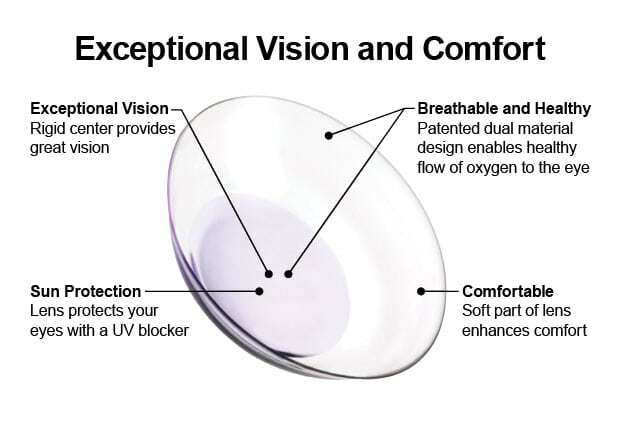 For early keratoconus, we now have comfortable and convenient soft lens options such as the Kerasoft Thin. Soft and small diameter rigid lenses correct vision will in mild to moderate cases but do not work as well in those with more advanced keratoconus. If you have been fit with one of these designs, you can view the training videos on our contact lens product page here. Your doctor will go over which options will work best based on the level of corneal disease and your lifestyle. Please call our office to book a consultation. If you decide to proceed with a fitting, please download and sign this form and bring it to your appointment. Thank you for trusting your eyes to the experts at Mission Eye Care.